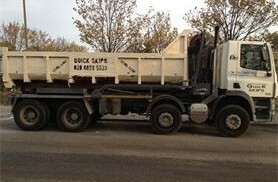 At Quick Skips London Ltd in Orpington, Kent, our grab hire service is one of the largest operating centres in Kent, Essex, and South London. We provide a full range of tipper lorries and grabber vehicles that work alongside the road. Choose us to meet all your waste disposal needs. With our grab hire service, there is no need for you to worry about the labour and stress of loading your skip! Just leave it to us, and we'll come and grab it for you hassle-free. All you have to do is give us a call! We pick the muck up and dispose of it so there is no need for you to worry about either of these two things. Our eight-wheel grab lorry can take the load of more than two six-yard skips, yet works out to almost half the price. What could possibly go wrong? • Waste Clearance for Driveways, Gardens, & Highways. Contact us to find out more about our tipper lorries and grab hire services.